Pakistani off spinner Saeed Ajmal proved that he was one of the best in the present day cricket world by grabbing his career best 7 for 55 runs in the first Test against England. He mesmerised the English batsmen by his ‘Doosra’ and they were unable to read him. The world No.1, England was bowled out at 192 runs and Pakistan was in command after scoring 42 runs without any loss at stumps on the first day. The First Test match is being played at Dubai International Cricket Stadium (neutral Venue) from January 17, 2012. Earlier the English Captain Andrew Strauss won the toss and elected to bat on a good looking batting strip. The visitors started off cautiously against the pace attack of Umar Gul and Aizaz Cheema but Misbah-Ul-Haq surprised the batsmen by introducing off spinner Mohammad in the sixth over. The decision paid off instantly as Alastair Cook was caught smartly by the wicket keeper Adnan Akmal on just three runs. The first wicket fell at 10 runs when Jonathan Trott came in to the crease and joined in with the skipper Strauss. Trott looked aggressive from the word go and punished Cheema for consecutive fours in the 11th over but the bowler took revenge in the 13th over when he sent him back to the pavilion at 17 runs. The second wicket partnership contributed 21 runs and it was time for the master batsman Kevin Pietersen to show his potentials. Ajmal was brought in to the attack and he stunned Strauss by uprooting his off stump when he had scored 19 runs. Ian Bell became his next victim when he had a finest edge and Adnan held another well judged catch. England was cornered by Ajaml when he got the important wicket of Pietersen on the review once he was declared leg before wicket at mere two runs. England had lost their five top order batsmen for just 43 runs when young Eoin Morgan and Matt Prior joined together at the crease and started playing sensible cricket. Morgan became the next victim of Ajaml when he was caught plumb in front of the wicket and was declared lbw at 24 runs. 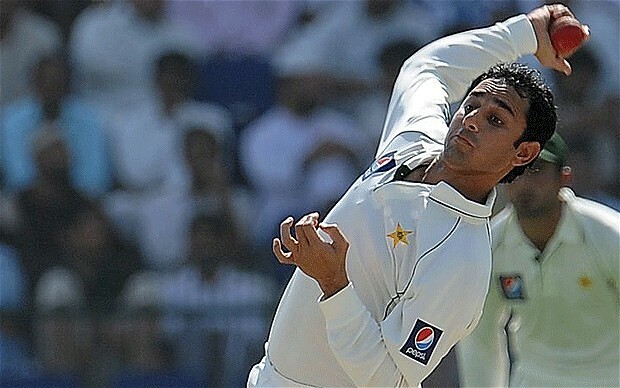 The sixth wicket associated 39 runs and fell at 82 runs as Ajmal once again showed his tricks by clinching the wicket of Stuart Broad after the addition of eight runs in the total. The situation became very critical for England when Prior and Graeme Swann give stability to the innings by producing a fine partnership of 57 runs. Swann was the seventh batsman to go back to the pavilion once he was clean bowled by leg spinner Abdur Rehman at 34 runs. Prior held one end by scoring unbeaten 70 runs as Ajmal ripped through the tail and the England’s innings was folded back at 192 runs in 72.3 overs. Saeed Ajmal was the star performer as he exhibited his career best performance of 7 for 55 runs, Cheema, Hafeez and Rehman claimed one wicket each. Pakistan stabilised its position by scoring 42 runs with all ten wickets in hand, Hafeez and Taufeeq Umar were unbeaten on 22 and 18 runsrespectively. Pakistan was at the driving seat by the close of the first day’s play and would like to take a substantial lead in the first innings whereas the English bowlers will try to restrict them to a minimum first innings total.